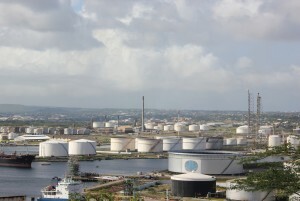 WILLEMSTAD - The trade unions representing the oil refinery employees have called up their members to protest against the lien placed by the Humanitarian Care Foundation, SMOC and 25 residents this morning on the assets of the refinery. These organizations and citizens want the judge to impose a penalty of 75 million on the refinery. According to the trade unions, the existence of the oil refinery is at risk. The summary proceedings to lift the lien took place this morning.